I had this great opening paragraph worked out, but after doing some research I realized I was somewhat incorrect in my facts. That being said, I’m going to take a few liberties to introduce this game, so you’ve been warned! 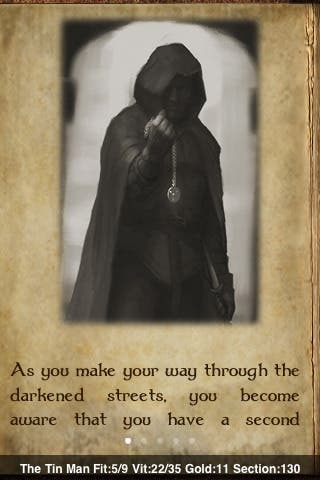 The style of entertainment presented in Gamebook Adventures was first popularized by a series called Choose Your Own Adventure which began in 1979. The simple idea was to let the reader help guide the action in the story. Then someone with my best interests at heart came up with the idea of adding some role playing elements to these books, and thus was born series like Fighting Fantasy and Lone Wolf. The down side was that you needed some combination of pen, paper and dice in addition to the book. Not quite so portable. In the midst of all this, similar types of entertainment were brewing on the home PC front, and as computer games became more and more sophisticated the need for non-electronic versions of these pastimes became less desirable. Thankfully there are some that still relate to the spirit of CYOA and “fighting fantasy” style books, and as a result we have An Assassin In Orlandes. Boy am I glad this developer was a fan of these old books. All you need to do is see the title screen and main menu to know this game is going to exude quality. I mean lets’ face it, any game whose main menu comes complete with a roaring fireplace can’t be all that bad, right? Anyway, from the main menu you can do several things, but the first thing I’d suggest is reading the rules. You might save yourself some of the frustration that I’ve experienced. 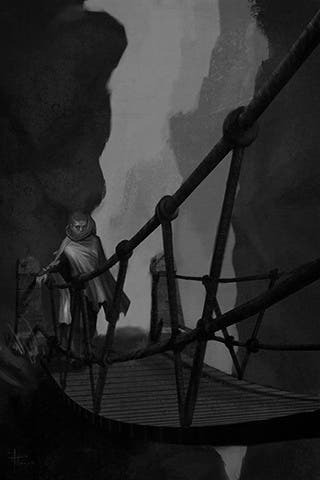 Once you’ve explored the help and some of the other features, it’s time to read the gamebook. If you’ve got an adventure in progress you’ll start right where you left off, but if not you’ll have to create a character first. There are two stats that you have to roll for: Vitality and Fitness. The starting vitality is your maximum life, which can only be raised in extremely rare cases. Fitness is used at various points throughout the story to determine whether or not you can perform a certain task. It can also be used in combat, though a failed roll against Fitness while fighting can have dire consequences. One minor niggle is that unless I missed something, there is no way to re-roll your stats short of quitting the game and restarting. A “are you satisfied” option would have been nice here. You can also rename your character, and then the adventure begins. They’ve done an excellent job of making the game feel like a true virtual book, though I think it would have been cooler to “flip” the pages by virtual corners than to have the standard iPhone page turning navigation at the bottom of the screen. However, not knowing anything about iPhone programming, that may not be possible. At any rate, occasionally there will be a graphic to start off a section of the book, and then you read until you get to a page where you’re presented with choices. When you get the opportunity to decide your fate there will be several options listed, each of which is followed by an icon. A red circle with a slash is an option that you can’t take, and a green circle with an arrow is an option that you can take. Other icon colors appear to be actions that you must take. Sometimes your action will simply take you to another section to read. Other times you will have to make a roll against Fitness to see if you can do something (ex: chase a bad guy). Last but certainly not least are the times where you must fight. In both cases where you have to roll dice the screen will change to show an area with dice on the top half and information about what you’re doing with the dice on the bottom half. 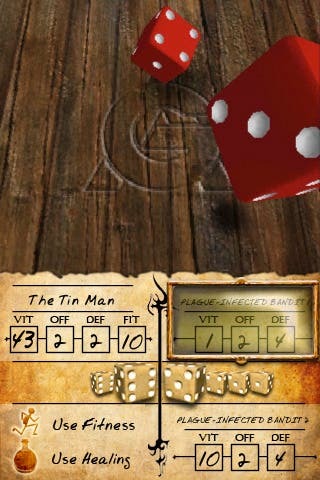 Whenever instructed by the game, you simply tap the top half of the screen to roll the dice. For a fitness check, the roll will contain two dice, and the sum will be compared against your Fitness. If the roll is less than or equal to your Fitness, you succeed in your task. If it’s higher you fail. The only exception to this is if your Fitness is 12 – to avoid “Superman syndrome”, a roll of 12 with a Fitness of 12 will still fail. Combat is an interesting beast. Fighting occurs in rounds, with you attacking first and then your opponent(s). You can fight up to two bad guys at a time, though it appears that you can only attack the first one until they are disposed of. Unfortunately for you, both bad guys attack you each round. To mimic the feel of the physical gamebooks you’ll “roll” dice, but what’s kind of weird is that you roll the dice for the opponents as well. I guess this is cool, but it would be even cooler if there were an option to turn this off and let the computer roll for the bad guys. It would just save some tapping. I’m not really sure I like how combat resolution is resolved, either. The number of dice used to attack is the attacker’s OFF (offense) number. The number of dice used to defend is the defender’s DEF (defense) number. What’s annoying is that the highest die between the two rolls wins (with a tie going to the defender). So, if you have three dice to attack and your opponent only has one die to defend, but you roll all low numbers and the opponent just happens to roll a six, you miss. The same principle obviously applies when you’re defending. It just seems that there’s potentially not much reward for being able to roll more dice then your opponent, except that if you are successful in the attack the sum of all dice equals the damage you deal. I’m also not real keen on the save system. If you either return to the main menu or exit the game while in the book via the home button, you’ll start back up from the beginning of the last section you were in. For the most part this is fine, except should you happen to have won some really intense fight in the middle of a section. That’s where bookmarks come in. If you set a bookmark you will return to the exact position that you left off. The problem is that you only get 3 bookmarks each time you restart the story. Once you set and use a bookmark it’s gone. I realize that save systems like this are meant to keep the challenge up, and that’s acceptable for desktop games where it’s expected that someone might put several hours into a game at one time. On a portable system, however, where a good number of players might be in the game for 20 minutes or less at one sitting, I think a more flexible save system is required. The story is very well written. Now I know that seems like a no-brainer, but my point is that they didn’t use the novelty of the mechanics as a crutch for lack of a story. In fact, the story goes beyond the game itself. From the main menu you can view a map of Orlandes and surrounding area, giving you a “big picture” of what this adventure is all about. There’s also a book called Orlandes Uncovered, which provides you with some history on the town, various creatures you might encounter, and things like that. Not all of this information is available right away, but it’s nice to know they’ve gone the extra mile to create part of a universe, and not just a secluded story. I don’t know if they’ll revisit Orlandes with future gamebooks, but my vote is that they do. The game is not heavily graphics laden, being as it is basically an interactive eBook, but it does look nice. The main menu looks quite nice, making me hope they consider making graphic adventure some day. When illustrations do pop up they have a neat hand drawn quality about them. I do wish there were a few more of them throughout the game, so hopefully that will pick up a bit in future installments. I found the default font and size for the text are very easy to read, but for those who might not they provide three different fonts and three different font sizes. You can even choose between two different “paper” colors. I rather enjoy watching the dice roll, since the fact that they bounce around each other and can actually land on top of each other means they employed some sort of physics to the die rolling. That’s a wonderful indication of attention to detail. The main sound effects you’ll hear during the game come from turn the pages and rolling dice. And, they’re pretty much the kind of sounds you’d expect to hear from turning pages and rolling dice. The music sounds good and suits the game quite well. I have to say though that for some odd reason as I listen to the music I keep expecting Antonio Banderas to pop up from out of nowhere. Playing “An Assassin In Orlandes” has brought back fond memories from my youth, working my way through such classics as the Lone Wolf series (go ahead parents, roll your eyes now). Tin Man Games has done an admirable job of recreating the experience in an electronic format, and I haven’t lost one die yet! The story is top notch, the interface works quite well, and the music really gets you into the atmosphere of Orlandes. This is definitely a title worth taking a look at, especially if you’re familiar with the print version of this type of book. I for one am quite eager to see what future installments of the Gamebook series will have to offer.